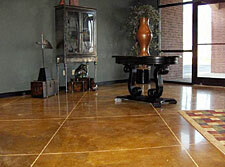 Concrete staining and polishing creates a floor that is chemically stained and translucent in color. The stain is applied to cured concrete and a chemical reaction occurs between the cement and the acid staining element. Bear in mind, the individual rocks in the concrete won’t be stained. Acid etching of the concrete creates an interesting and appealing look to the surface. Using a bit of creative application, different colors can be created. If the floor is already in place, a layer of new concrete may be necessary, or completing a smoothing process of the existing floor if necessary. Concrete is a versatile material that can handle various shapes, textures, and colors. There are tiles, pre-cast, and cast-in-place concrete floors. It should be sealed for its maintenance because acid staining etches into the concrete causing it to be more porous. The acid stain makes any imperfections or variations appear artistic. Water-based sealers are a good choice as are epoxy or urethane. If sealed, just clean with sweeping and a damp mop. Stained concrete is increasing in popularity and Keith Clay Floors can help you implement the look into your home or business. Mobile concrete polishing services can be accomplished with or without the acid stain process to create a highly polished shine. Concrete floors can even be honed down to expose the aggregate within the concrete, often creating dramatic textured looks with polished. Keith Clay has been in business for 30 years serving Dallas, Frisco, Plano, Richardson and all Dallas Metroplex suburbs. We know wood floors and can answer any questions you may have. If you want the best job from a company of professionals, or to schedule your free on-site estimate now, or to request more information about our products and service, please call us in Dallas at 972-463-6604.